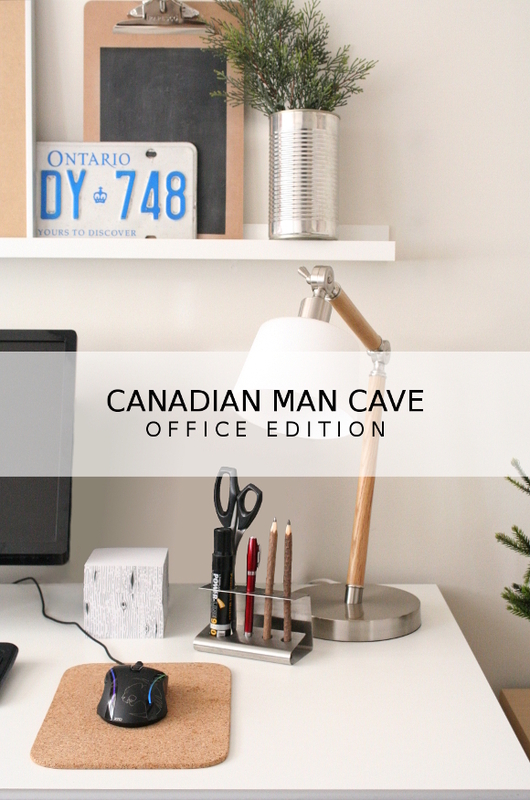 Canadian man cave – reveal! 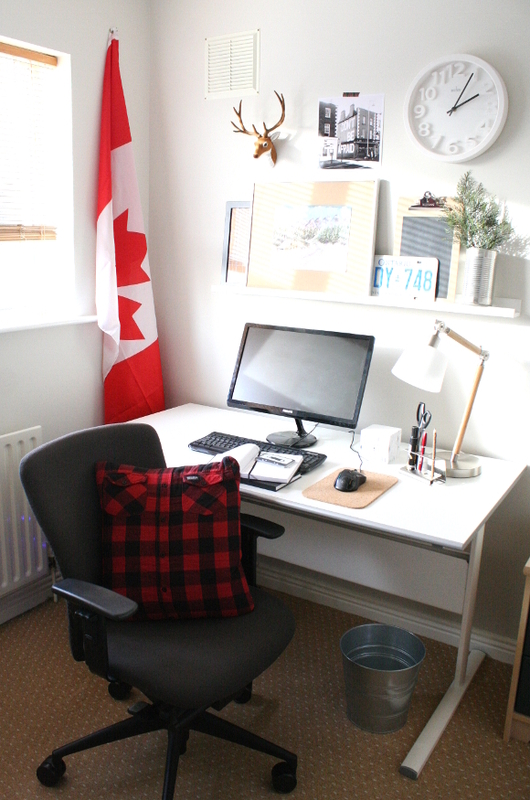 After 4 months of brain storming, DIYing and carefully planning, my brother’s Canadian man cave office is complete! I finished and photographed the room yesterday afternoon, and after wading through 200+ photos, I’ve narrowed it down to just a handful of pictures. Times four. As my brother’s a college student, the budget for his home office was basically non-existant. But for me that just made it more of a creative challenge, and I personally find that more interesting than someone throwing a wad of money at me to design a place. But I will say, if you feel so inclined to throw a wad of money at me, you will still have my attention. Note – I’ll be including a source list at the end of the post, so if you see something that I haven’t mentioned, it’ll be mentioned there! There are so many changes that happened in this room, I don’t really know where to start. I first moved his desk so it was along the back wall with the window now on its left. It’s now the first thing you see when you walk in the room and as he’s right handed, the most amount of natural light is coming from the left. I added an IKEA shelf above the desk to hold a few piece of artwork and a chalkboard clip board. 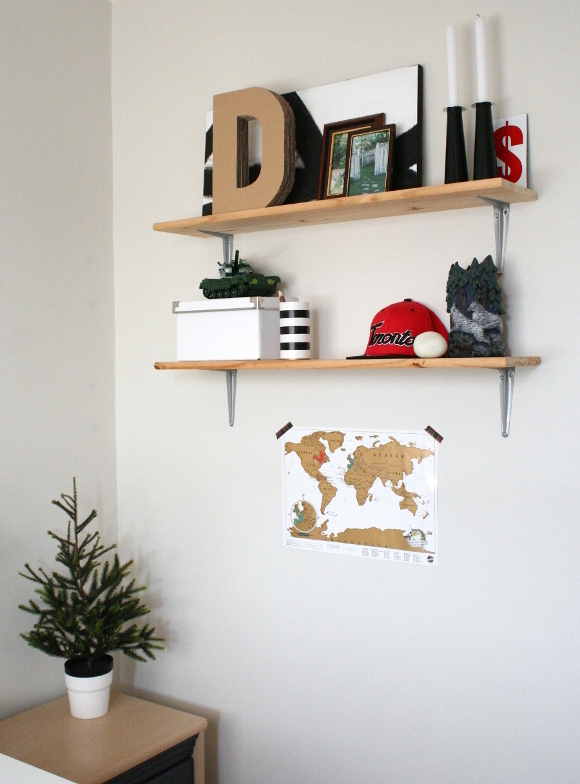 I wanted to use this type of shelf here so my brother can easily change whatever is in his line of sight above his desk, without hammering loads of holes in the wall every time he changes his mind. 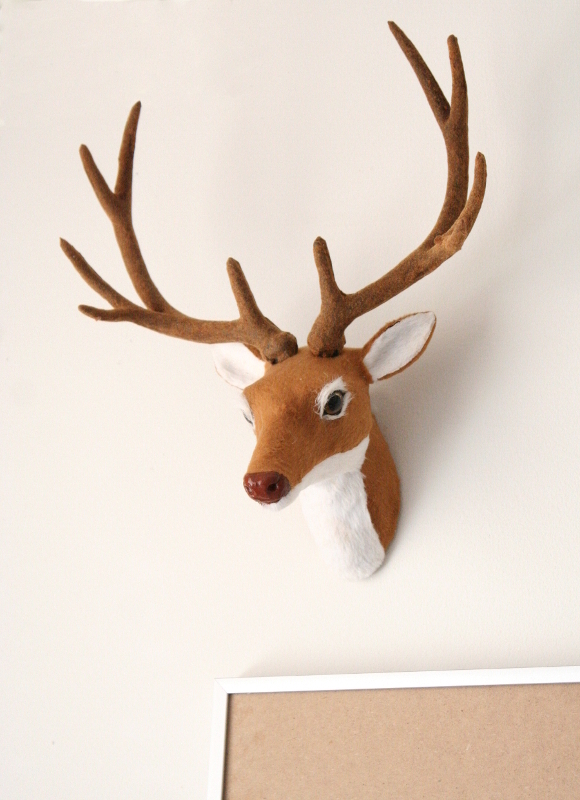 I styled it with one of my dad’s old Ontario licence plates, a clock from Tesco, a faux taxidermy stag from Tiger, and of course some artwork. It was important that there was artwork in his room. Manly artwork. And since we were on a tight budget, we DIYed most of it. 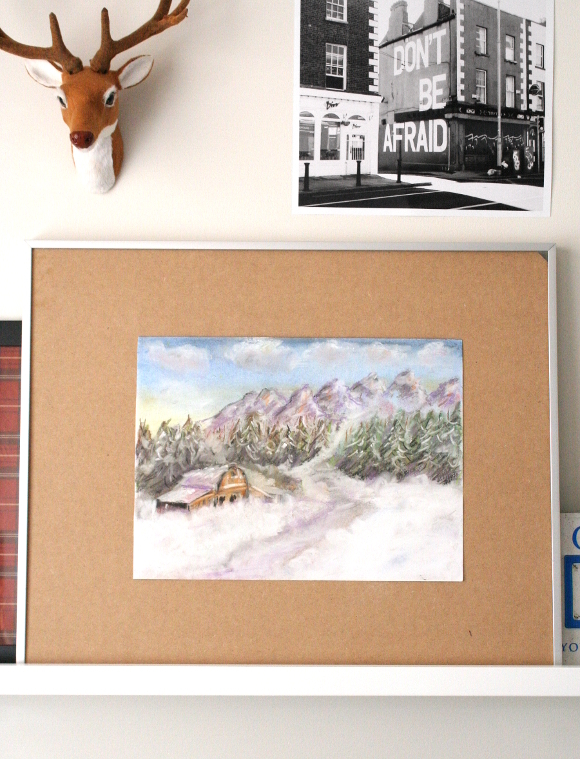 I asked our incredibly talented and artistic mom to create a Canadian scene to hang over my brothers desk. She created this pastel piece in an evening. It’s perfect as it’s one of those scenes you could get lost in. I also printed an Instagram I took of some of Maser‘s work as some encouraging words, and hung it over with some manly plaid washi tape [that arrived just as I was leaving yesterday – YUS]. 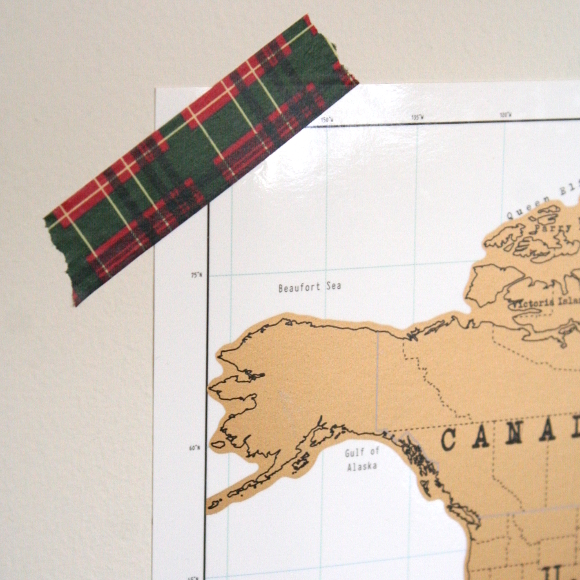 I also framed some plaid wrapping paper I picked up over the holidays so add some depth. 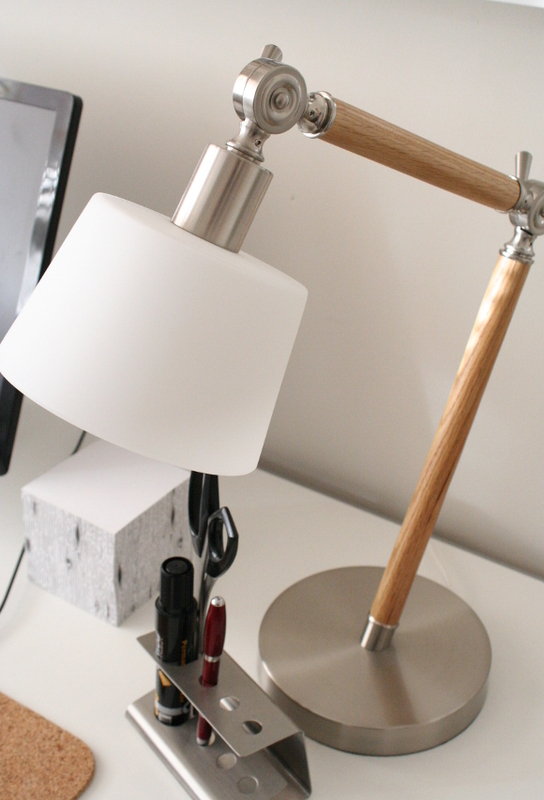 My brother wanted a ‘man lamp’ for his desk, and he mentioned he really liked angular lamps. I searched high and low for a lamp with a translucent shade. Why a translucent shade? It was important that if my brother was using just this lamp in his office on a dark day, a lamp with a solid shade would be very harsh and not cast light throughout the room; it would only cast light down at his desk. But this way, this warm lamp will light up the rest of his room. 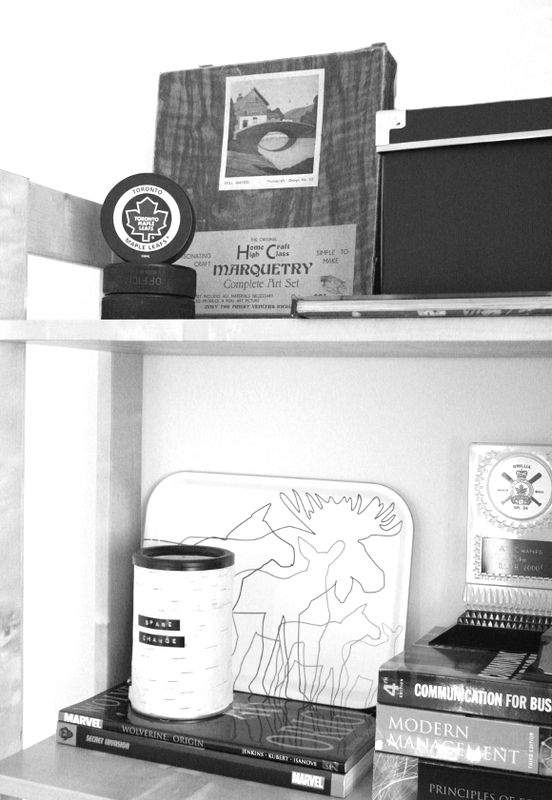 It was important I reuse as much as I could when redesigning my brother’s office. My parents had a set of old shelves so we removed the previous wooden brackets and I added a slightly more industrial style bracket to make it seem a bit more manly and rustic. I had way too much fun going through all our old treasures to deck out the shelves. 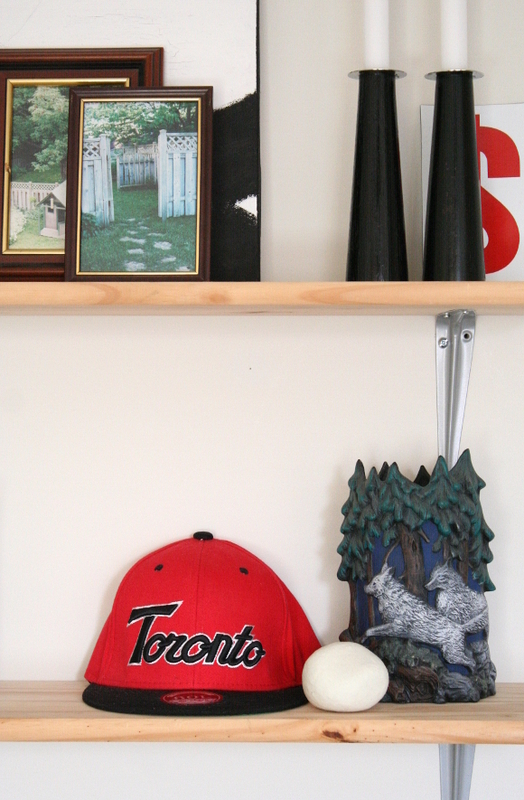 I used an old black and white canvas I painted for our office as a backdrop [as seen here], added some pictures I took of our backyard before we left Canada, a wolf vase I painted in primary school in Canada, a baseball cap and of course – LEGO. My favourite thing is that little white ball. 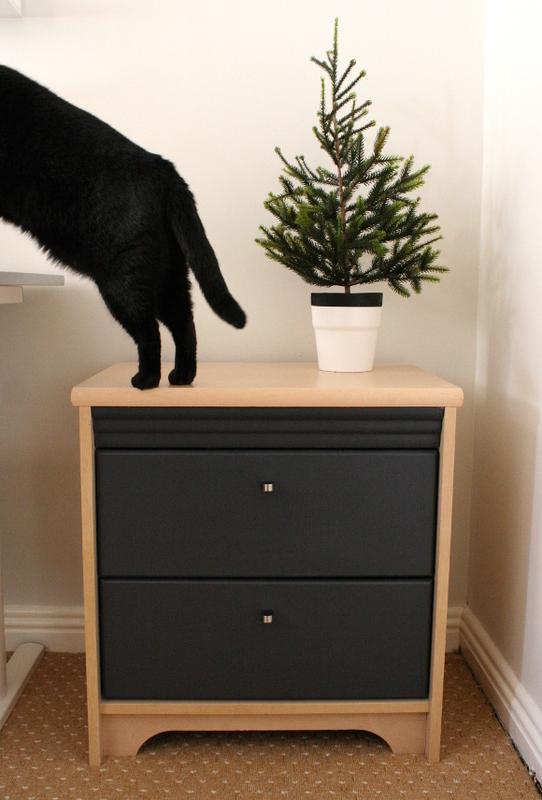 Husband and I bought that when we were in a design shop in Helsinki – it’s an everlasting snowball. When you squeeze it, it crunches and sounds exactly like a compacted snowball. I mangle it every time I see it. I got the loveliest text from my brother yesterday to thank me for all the work that went into his room. I’m sure there were a couple of moments where he wanted to tell me where to go, but he was strong. For me the most rewarding part was taking a room and turning it into a retreat that will help my brother work towards his goals and of course chillax. After all, that’s all design is – creating a comforting and inspiring environment. 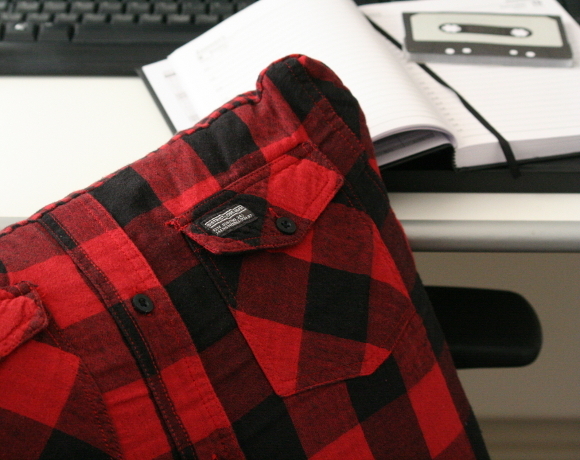 Man pillow – check out my tutorial here! Chalk clip board – see my tutorial here! 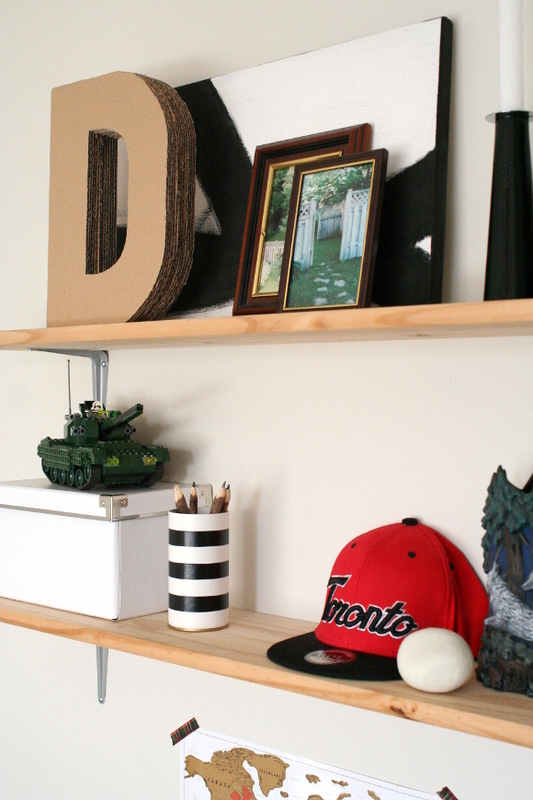 Cardboard monogram – check out my tutorial here! Black and white striped mini vase – see my tutorial here! 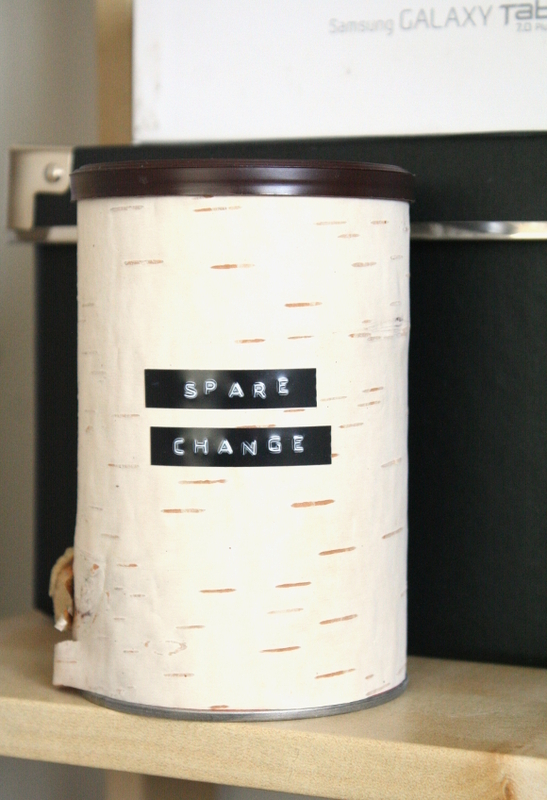 Birch covered change container – see my tutorial here! Awesome! I have so much to say… The room is brilliant. 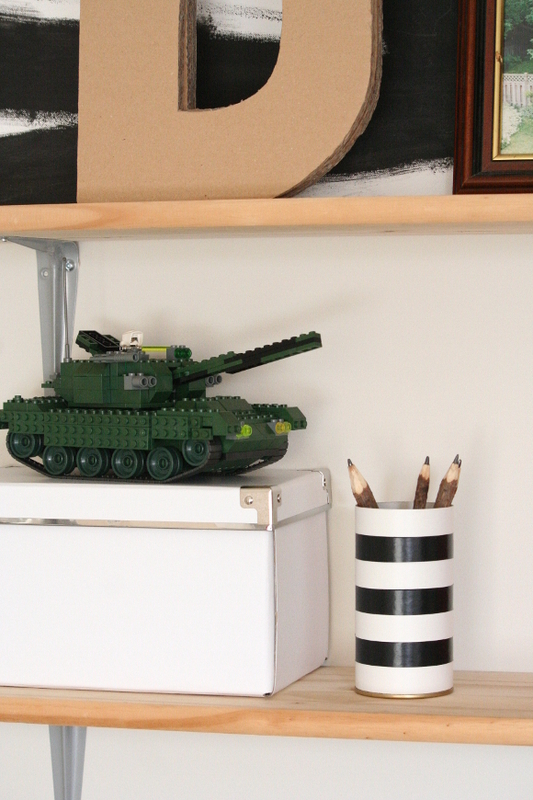 Loving the little touches: The Lego tank, the tree, the washi tape. Nice score on that. 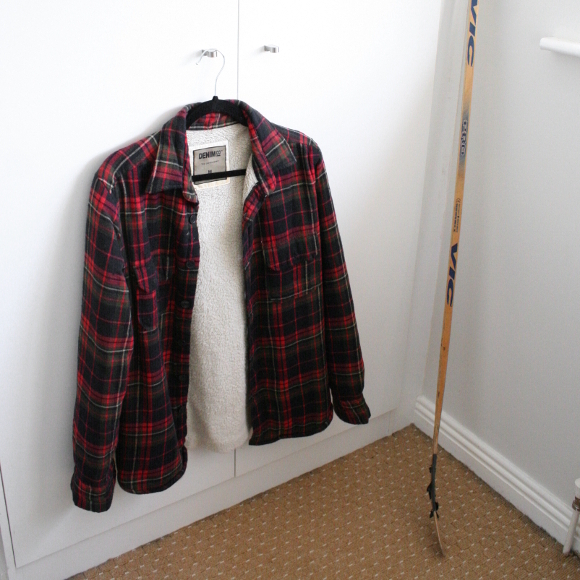 The hockey stick is a must. The manly artwork would make Ron Swanson (or Nick Offerman) proud. The hand painted wolf case!! Holy heck I love childhood finds. And for selfish reasons, the drafting desk – love. Also, the flag looks so sharp in that setting. Love it. I hope it brings back fond memories for your family. Coming from you Pat, who inspired the Canadian theme with your nursery, that means a lot. I'm glad you think it's legit! And not too over the top Canadian. I was going to pin up the flag much like a poster, but I thought no, too much. Just little pieces and memories here and there. I'm actually quite mad it's not my office. I spent so much time in there pondering things and moving stuff around. It was so lovely getting to dig through all our memories. My bro's office is like a time capsule. Ahhh!! This is just so groovy – I love how 'woodsy' it all is, totally took that theme and ran with it… and not in a tacky way at all!! (wait, am I digging a hole?) I just mean that themed rooms can go bad and this in no way at all has gone bad – its rather fabulous! 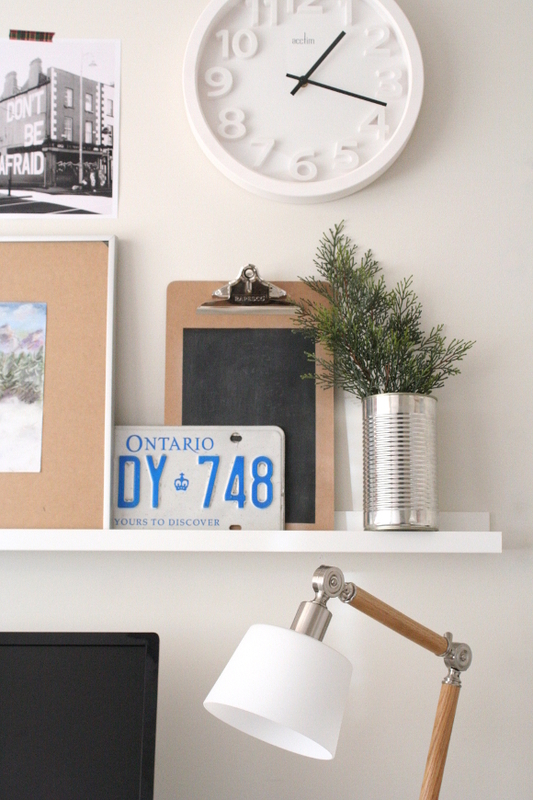 I love the pillow and the washi tape and all the little DIY touches – you are AMAZING. Love it. Haha, you're not at all digging a hole at all! I know exactly what you mean and I wanted to completely avoid the whole tacky over-the-top patriotic theme, so I'm glad I didn't achieve that. This is amazing! You must be so pleased with it, and so must your brother – such a successful makeover! I really love how you've styled everything, and all the personal touches you've used. I have to say that your mum is so talented – that picture is incredible!! I can see where you get your creativity from! 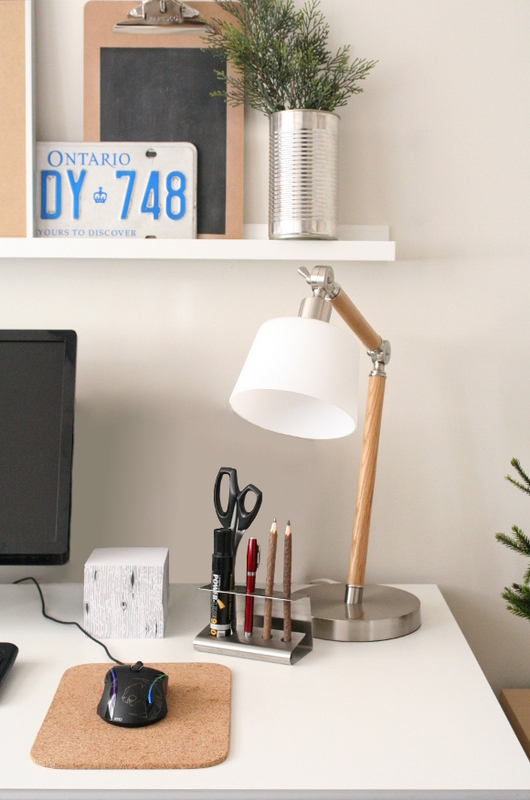 The lamp you've chosen for his desk is really great too – I'm trying to think where I could put one of those in my house! To be honest, I could blather on all day because there are so many amazing elements that make up this design. Great work!! Aw, thank you so much Maria! You are far too sweet. I'm really pleased with how it all turned out. I actually completely changed the shelving on both walls only on Wednesday, and I'm so glad I did. Previously, everything was on one wall so the focus was only in one area. I changed it at the last minute, but I'm glad I did as it seems more personal this way. when will you be sharing the man pillow you made? it looks amazing!!!! no pressure, lol. Just got confirmation that it'll be published on the 17th of this month, John! I'll be blogging about it too so keep your eyes peeled.